Literature > American literature > Biography, memoirs, letters, etc. Never one to suffer fools gladly, especially if they wore crinolines, Mark Twain lost as many friends as he made, and he targeted them all indiscriminately. The first major American writer born west of the Mississippi River, he enjoys a reputation unrivaled in American literary history, and from the beginning of his career he tried to control that reputation by fiercely protecting his public persona. 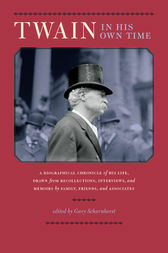 Not a debunking account of Twain’s life but refreshingly immune from his relentless image making, Gary Scharnhorst’s Twain in His Own Time offers an anecdotal version of Twain’s life over which the master spin-doctor had virtually no control. The ninety-four recollections gathered in Twain in His Own Time form an unsanitized, collaborative biography designed to provide a multitude of perspectives on the iconic author. Opening with an interview with his mother that has never been reprinted, it includes memoirs by his daughters and by men who knew him when he was roughing it in Nevada and California, an interview with the pilot who taught him to navigate the Mississippi River, reminiscences from his illustrators E. M. Kemble and Dan Beard and two of his so-called adolescent angelfish, contributions from politicians and from such literary figures as Dan De Quille and George Bernard Shaw, and one of the most damning assessments of his character—by the author Frank Harris—ever published. Each entry is introduced by a brief explanation of its historical and cultural context; explanatory notes provide further information about people and places; and Scharnhorst’s introduction and chronology of Twain’s eventful life are comprehensive and detailed. Dozens of lively primary sources published incrementally over more than eighty years, most recorded after his death, illustrate the complexities of this flamboyant, outspoken personality in a way that no single biographer could. Gary Scharnhorst is Distinguished Professor of English at the University of New Mexico. Coeditor of the journal American Literary Realism and editor every other year of the research annual American Literary Scholarship, he is the author or editor of eighteen books, most recently Bret Harte: Opening the American Literary West, selected by the Western Literature Association as the Outstanding Book in Western American Literary Criticism for 2000, and Interviews with Mark Twain, 1871–1910.